Are the pedals of change in Los Angeles County gaining momentum? 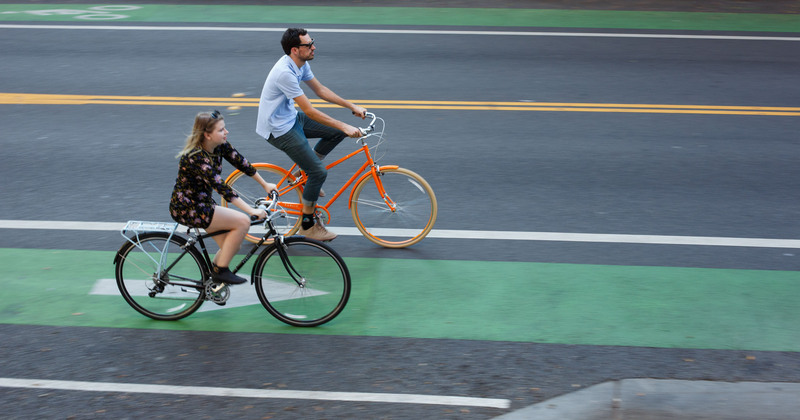 As we’re in the midst of Bike Month, it’s worth taking stock of where we are bike-wise given the many bike-related projects and programs happening. Statistics are not in huge supply. But there is one worth considering from the U.S. Census Bureau, which shows that in 2005 about .6 percent of commuters in Los Angeles County used a bike to get to and from work. By 2015, that number had increased to one percent of commuters — in raw numbers an increase from 25,477 bike commuters to 47,075. Okay, those numbers may not scream “revolution.” But it’s a nice uptick in a span of time when the number of people driving to work also slightly increased. The bike numbers are also pleasing because — let’s be real, folks — many swaths of our sprawling county remain not exactly bike friendly. Of course, many people who bike don’t use their bikes to reach their jobs. That’s where it gets harder to determine how we’re doing bike-wise. We know that bike sales across the country have been very solid this century. We also know that there is no shortage of local bike shops, many local cities have completed or finished new bike plans and, anecdotally, it seems as if there are more people on bikes these days. Let’s consider some things that we can quantify and qualify that have happened in the past decade. The most important is this: Metro now views bikes as a legitimate transportation mode — not just a novelty or something used for recreation. To put it another way, Metro sees bikes as a viable way of getting around and closing the gap between transit and work/home/play destinations. •Metro’s Bike Share pilot program, which launched in downtown Los Angeles last summer and is expanding this summer to Pasadena, the Port of Los Angeles and Venice. –The agency’s Rail-to-Rail/ River project is building a 10-mile east-west walking and biking path from Inglewood to the Los Angeles River. It will connect major bus and rail lines in South L.A. and the L.A. River Bike Path to Long Beach. The path is planned to open from the Crenshaw/LAX Line to the Blue Line in 2019. –Metro’s L.A. River Bike Path Gap Closure Project is in the first slate of Measure M-funded shovel-ready projects and is set to begin construction in 2023. Closing the eight-mile gap in the river path between Elysian Valley and Vernon will create a continuous 32-mile path for people to walk and bike on away from car and truck traffic. –Pedestrian and bike access to Union Station, our region’s largest transit hub, is set to be improved by a half-dozen different projects, including the L.A. Union Station Forecourt and Esplanade project. Recognizing that most people who use transit start and end their trips without a car, these efforts are poised to help boost ridership. •Metro has an Open Streets grant program to fund events such as CicLAvia, 626 Golden Streets and the many other events that close streets to motor vehicles and open to people walking, biking, or skating. •A decade ago, bike lanes were most often a painted line separating car traffic from bikes. Nowadays, cities are increasingly looking at protected bike lanes in which some type of physical barrier — sometimes bollards, sometimes a parking lane — are used to protect people on bikes from vehicle lanes. A decade ago the thought of closing down local streets for a bike event was laughable in many quarters. But area leaders made it happen with an assist from Metro and today the events are hugely popular and a great chance for everyone to get aboard their bikes. The traffic nightmares? They’ve never really materialized thanks to good planning and traffic control. And the events have served as a nice reminder that you don’t always need a car to get around our region. One other thought I’d like to raise. Making it easier to get around on bikes is a tough business. To get more people to ride, you need more bike infrastructure. But finding space for bike lanes and paths requires political support — and that’s not always easy without a critical mass of riders. Still, we’ve seen some cities — Long Beach, Santa Monica, Temple City and the city of L.A., to name just four — making great strides adding bike infrastructure that has proven popular with the public at large. Is it a worthwhile endeavor? I think so. Biking is popular in places around the planet. People like to ride. There’s no reason it can’t happen here — we just need to make the improvements that will put more people on bikes. What do you think, people? What changes have you seen bike-wise in our region? What would you like to see? Count me in on the revolution. I now ride virtually every day. My commute is now a combination of bike and train. Okay, actually an ebike which makes the daily ride much more enjoyable. Almost all of the commute is very safe and comfortable because I have access to the Ballona Creek bike trail. There are still a couple segments of the journey that need better biking infrastructure. Ballona Creek, IMHO, is a bit of an unappreciated path — you can jump off Expo at La Cienega/Jefferson and use the path to reach the Marina and the beach path, then ride either north to SaMo or south to Hermosa and Redondo. That’s a pretty good haul and also a pretty good way for some Westside residents to access the train via bike. There’s a bike hub planned for Culver City Station, but I’d be interested to know if bike parking is an issue at La Cienega/Jefferson and, if so, it’s because of the nearby Ballona bike path. Bike parking is a problem at the La Cienega/Jefferson station. As a matter of fact, bike parking is a problem at all of the stations along the Expo Line. There is a waiting list of 28 people for one of the bike lockers at the La Cienega/Jefferson station. The Culver City station is much worse. There the waiting list for a bike locker is 109 people for 24 bike lockers. There are only 3 available lockers on the entire rail system. Perhaps this might be a clue to Metro that more lockers are needed? Avid pedaler here as well, just local jaunts for errands, Just so much easier getting around the Hollywood area than driving. And I’m meeting more & more who really rely on their bicycle for getting around. Gave up trying to getting the local Pavilions to put in a real bike rack so we use the shopping cart corral. I tend to shop at places that have bike racks or don’t mind my bringing a bicycle inside. All the Trader Joes have racks. A “shovel-ready” project is slated to begin construction in 2023? What’s “shovel-ready” about that? Hey Bob — we’ll have a post up relatively soon about the L.A. River project and the planning that is underway. I think this is a great project but it certainly has some design challenges given existing infrastructure and buildings along this stretch of the river. The planners have some pretty neat ideas and I encourage anyone interested to check out the project home page at https://www.metro.net/projects/lariverpath/. A city of Los Angeles Bureau of Engineering engineer stated at a recent public meeting that it would take at least ten years to install the last 12 miles of bike/ped path along the LA river in the San Fernando Valley. I would have to assume that the much more difficult 8-mile stretch east of downtown LA would take at least as long to complete. “Closing the gap” is what is needed for the gaps between many of the wonderful “bicycle-friendly” routes. There are now bike routes over many parts of the city. Getting to those routes, as well as transiting from one route to another, are the major problems. Hopefully some day we bicyclists will be able to go over major stretches without having to traverse long stretches where there is high speed and/or heavy automobile traffic. Some time ago, I read a fictional book about a mythical city with the typical grid of streets. The streets were assigned usage, such that every other street in each direction was restricted to only motorized traffic, and the streets in between were restricted to only non-motorized traffic. Obviously, this was pure fiction. That made too much sense for reality. Haha Bob has a point! Speed that project up. I’d love to see lanes on all the main arterials. At the moment the network is very spotty so you need to take a combination of sidewalks, streets, and lanes, and sometimes totally circuitous routes to get from A to B. For example, I should be able to bike down any of the main north/south streets to any of the main east/west streets. Several different elements are coming together to lay the foundation for a strong increase in the rate of cycling in the LA area.. Ciclovia type events create political will. Some of the new sales and motor fuel taxes will be used for bicycle infrastructure, funding from Universal/NBC for the LA river bike/ped path, bike sharing, protected bike lanes and bike hubs. There’s more funding overall to create a lot more bicycle infrastructure that will grow the rate of cycling. Since I visited Germany, I have become a bike rider..it is nice and healthy. I think the Bike Hubs may help educate some potential riders about the ease of fixing bicycles. A lot of people have no mechanical knowledge of their bike and are riding on deflated tires, with sticky chains, and having a bad time. If they learn what is wrong and how to fix it, riding will be easier and they will know at least when to bring in their bicycle for a tune-up. They are used to taking a car to a mechanic and getting it back in working order. A bike owner needs to have a higher level of knowledge about the machine. Another “push” I would like to see is a bicycle component at the DMV training course before a person gets a Driver License. (And all existing drivers should have to take that component.) I think bike riders would feel safer knowing that the (licensed) drivers on the street are sensitized to the presence of bikes. I would also like to see bicycle training mandatory in high schools. That will help riders feel confident about asserting themselves on the road, and riding in the street with the cars. These are all great ideas. I’m someone who has been meaning to take a bike repair course for quite some time as I ride often but usually have to haul my bike over to the shop to fix things I should be able to do. I know many bike shops do offer repair classes. Plus it also looks like fun.